Dr A K Saluja, Department of Surgery, Beth Israel Deaconess Medical Center, 330 Brookline Avenue, Boston, MA 02215, USA. Background and aim: Recent studies have indicated that prior thermal stress causes upregulation of heat shock protein 70 (HSP70) expression in the pancreas and protects against secretagogue induced pancreatitis. The mechanisms responsible for the protective effect are not known. Similarly, the effects of prior non-thermal stress on HSP70 expression and pancreatitis are not known. The current studies were designed to specifically address these issues. Methods: In the current studies pancreatitis was induced by administration of a supramaximally stimulating dose of caerulein 12 hours after thermal stress and 24 hours after non-thermal (that is, β adrenergic stimulation) stress. Results: Both thermal and non-thermal stresses caused pancreatic HSP70 levels to rise and resulted in increased expression of HSP70 in acinar cells. Both forms of stresses protected against caerulein induced pancreatitis and prevented the early intrapancreatic activation of trypsinogen which occurs in this model of pancreatitis. Conclusions: These results suggest that both thermal and non-thermal stresses protect against pancreatitis by preventing intrapancreatic digestive enzyme activation and that HSP70 may mediate this protective effect. In the present communication, we show that prior β adrenergic stimulation, as well as prior thermal stress, can lead to intrapancreatic upregulation of HSP70 expression and that β adrenergic stimulation, like thermal stress, can protect against secretagogue induced pancreatitis. We show that intrapancreatic activation of trypsinogen after supramaximal secretagogue stimulation is prevented by either prior thermal stress or prior β adrenergic stimulation and that in both cases the upregulated HSP70 expression is primarily localised to the cytoplasmic acinar cell vacuoles which are believed to be the site of trypsinogen activation in this model of pancreatitis. We suggest that HSP70, which is expressed after either thermal or non-thermal (that is, β adrenergic stimulation) stress, protects against pancreatitis by preventing premature trypsinogen activation within acinar cells. Male Wistar rats (125–175 g), obtained from Charles River Laboratories, were housed in standard cages in a climate controlled room with an ambient temperature of 23 (2)°C and a 12 hour light/dark cycle. They were fed standard laboratory chow, given water ad libitum, randomly assigned to control or experimental groups, and fasted overnight before each experiment. Caerulein, the decapeptide analogue of the pancreatic secretagogue cholecystokinin, was purchased from Research Plus (Bayonne, New Jersey, USA), collagenase from Worthington Biochemical (Freehold, New Jersey, USA), trypsin substrate (Boc-Gln-Ala-Arg-MCA) from Peptides International (Louisville, Kentucky, USA), Superfrost/Plus slides and Permount from Fisher Scientific (Pittsburg, Pennsylvania, USA), and Vectastain Universal ABC and avidin-biotin blocking kits from Vector Laboratories (Burlingame, California, USA). Antibody used for western blotting and immunolocalisation of inducible HSP70 (cat. No. SPA 810) was obtained from StressGen (Victoria, Canada). Antirabbit TAP antibody was a kind gift from D McNally, Abbott Laboratories. All other chemicals and reagents were purchased from Sigma Chemical (St Louis, Missouri, USA). All experiments were performed according to protocols approved by the Institutional Animal Care and Use Committee of the Beth Israel Deaconess Medical Center. Thermal stress was induced using rats anaesthetised with an intraperitoneal injection of pentobarbital. They were placed on a heating pad and core body temperature was monitored with a rectal probe. Their core body temperature was gradually increased, over approximately 25 minutes, to 42°C and then maintained at that level for 20 minutes. β-Adrenergic stimulation was used to induce non-thermal stress. In this case, conscious animals were given a single intraperitoneal injection of isoproterenol (0.05 mg/kg). Pancreatitis was induced, 12 hours after thermal stress or 24 hours after administration of isoproterenol, by administration of five hourly intraperitoneal injections of caerulein (10 μg/kg). Control animals received comparable injections of saline. One hour after the final injection, animals were sacrificed by administration of a lethal intraperitoneal dose of pentobarbital. Pancreas samples obtained immediately after sacrifice were homogenised and aliquots (10 μg protein) subjected to sodium dodecyl sulphate-polyacrylamide gel electrophoresis according to Laemmli.9 The separated proteins were transferred to nitrocellulose membranes as described by Towbin and colleagues.10 Induction of HSP70 was monitored using antibody to inducible HSP70 (1:1000). Labelled proteins were visualised by the enhanced chemiluminescence method using horseradish peroxidase coupled secondary antibody (1:5000) and quantitated using a Scion Image Analysis Program. Pancreas samples were fixed (12 hours) in neutral buffered formalin, embedded in paraffin, sectioned (5 μm), and mounted on Superfrost/Plus slides. After being deparaffinised, endogenous peroxidase activity was quenched with 3% hydrogen peroxide (10 minutes) and non-specific binding was blocked by incubation in phosphate buffered saline containing 1% bovine serum albumin (30 minutes). They were then incubated in avidin and biotin blocking solutions (15 minutes each) with washes in-between. The sections were then incubated with primary antibody (anti-mouse HSP70 5 μg/ml) overnight at 4°C. Negative control sections were incubated similarly but without primary antibody. After rinsing, the sections were sequentially treated with biotinylated universal secondary antibody from Vector Laboratories (1:200) for 30 minutes, and with Vecta ABC reagent for another 30 minutes. The antigen-antibody complex was visualised using the diaminobenzidine (DAB) method (DAB 5 mg/10 ml phosphate buffered saline plus 12 μl of 30% hydrogen peroxide, three minutes) and slides were then counterstained with methyl green (1% in 0.1 M sodium acetate, pH 4.0) for 10 minutes. After rinsing in distilled water and butanol, they were cleared in xylene and coverslipped with Permount. 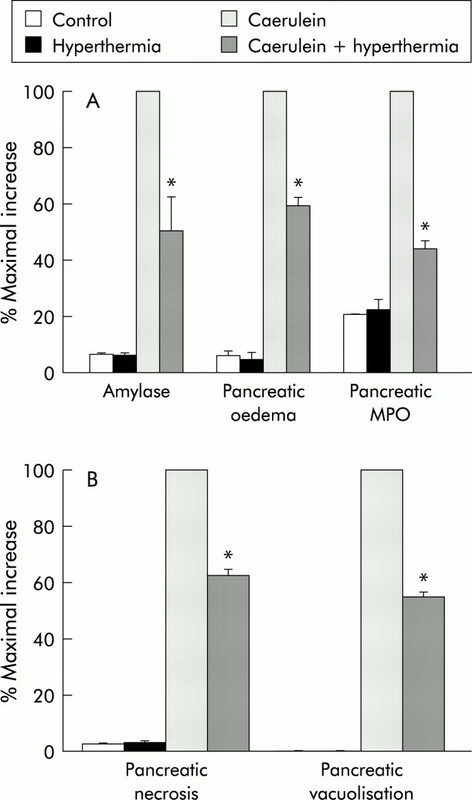 Fresh pancreatic acini were prepared from control thermally and non-thermally stressed rats using collagenase digestion, as previously described,15 and amylase secretion, in response to varying concentrations of caerulein, measured over 30 minutes.16 Amylase secretion was expressed as a per cent of total amylase content. Results are reported as mean (SEM) values obtained from multiple determinations in three or more separate experiments. In all figures, vertical bars denote SEM values and the absence of such bars indicates that the SEM was too small to illustrate. The significance of changes was evaluated using the Student's t test when data consisted of only two groups or by analysis of variance (ANOVA) when three or more groups were compared. Differences associated with a p value of less than 0.05 were considered significant. Exposure of rats to thermal stress resulted in time dependent upregulation of HSP70 expression in the pancreas. 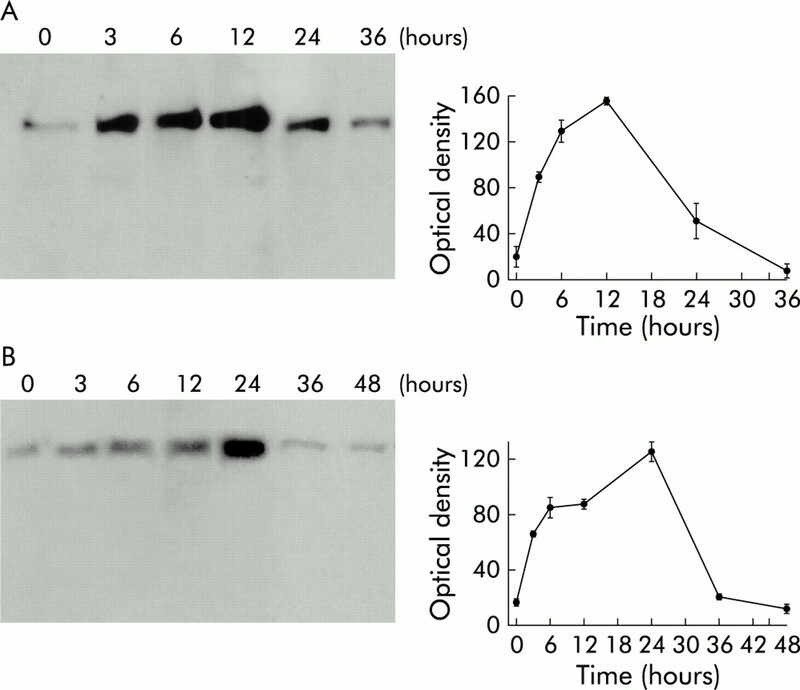 As shown in fig 1A, HSP70 expression was increased within three hours of thermal stress, reached a peak 12 hours after thermal stress, and returned to basal levels 24–36 hours after thermal stress. Effect of thermal stress and β adrenergic stimulation on pancreatic heat shock protein 70 (HSP70) expression. Rats were exposed to either thermal stress (A) or β adrenergic stimulation (B), as described in the text. At the indicated times, the animals were sacrificed, the pancreata were homogenised, and HSP70 expression was evaluated by western blotting, as described in the methods section. Relative optical densities are expressed as mean (SEM) values of at least three animals at each time point. Exposure of rats to β adrenergic stimulation, accomplished by administration of a single intraperitoneal dose of isoproterenol, resulted in time dependent upregulated expression of intrapancreatic HSP70. As shown in fig 1B, pancreatic HSP70 levels were increased within one hour of isoproterenol administration, reached a peak 24 hours after administration, and then declined to resting levels over the subsequent 12–24 hours. Pancreatitis was induced by administration of five hourly injections of a supramaximally stimulating dose of caerulein begun either 12 hours after thermal stress or 24 hours after administration of isoproterenol. As shown in figs 2 and 3, the magnitude of each of the parameters used to evaluate the severity of caerulein induced pancreatitis was reduced by approximately 50% following either thermal stress or β adrenergic stimulation. Effect of prior thermal stress on the severity of caerulein induced pancreatitis: 12 hours after exposure to thermal stress, pancreatitis was induced by caerulein administration and its severity was quantitated, as described in the text, in control animals, in control animals exposed to hyperthermia, in rats given caerulein, and in rats given caerulein after prior exposure to hyperthermia. Results are expressed as a per cent of the increase noted in non-stressed animals given caerulein (that is, maximal increase). Results represent mean (SEM) values for at least three animals at each time point. *Significantly different (p<0.05) from non-stressed caerulein treated rats. MPO, myeloperoxidase. 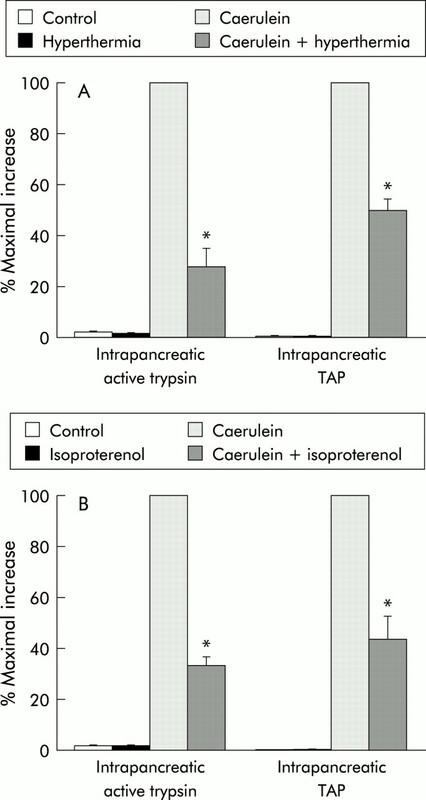 Effect of β adrenergic stimulation on the severity of caerulein induced pancreatitis: 24 hours after administration of isoproterenol, pancreatitis was induced by caerulein administration and its severity was quantitated, as described in the text, in control animals, in control animals injected with isoproterenol, in rats given caerulein, and in rats given caerulein after administration of isoproterenol. Results are expressed as a per cent of the increase noted in non-stressed animals given caerulein (that is, maximal increase). Results represent mean (SEM) values for at least three animals at each time point. *Significantly different (p<0.05) from non-stressed caerulein treated rats. MPO, myeloperoxidase. Intrapancreatic activation of trypsinogen can be detected during the early stages of caerulein induced pancreatitis (fig 4). Trypsinogen activation is manifested in two ways—that is, by the appearance of trypsin activity in the pancreas homogenate and by the rise in TAP levels in the homogenate. Both manifestations of trypsinogen activation were reduced by approximately 50% after either prior thermal stress (fig 4A) or β adrenergic stimulation (fig 4B). In contrast with its effect on trypsinogen activation, neither prior thermal stress nor prior β adrenergic stimulation altered pancreatic trypsinogen or cathepsin B content (not shown). Effect of hyperthermia and β adrenergic stimulation on caerulein induced intrapancreatic trypsinogen activation: pancreatitis was induced in rats after prior stress induced by hyperthermia (A) or administration of isoproterenol (B), as described in the text. Trypsinogen activation was monitored either by quantitation of trypsin activity or by measurement of trypsinogen activation peptide (TAP), as described in the text. Results are expressed as a per cent of the increase noted in non-stressed animals given caerulein (that is, maximal increase). Results represent mean (SEM) values for at least three animals at each time point. *Significantly different (p<0.05) from non-stressed caerulein treated rats. As shown in fig 5, there was virtually no HSP70 in the pancreas samples obtained from control animals (fig 5A). However, 12 hours after either thermal stress (fig 5B) or 24 hours after β adrenergic stimulation (fig 5C), when the level of HSP70 was at its peak in the respective models, as assessed by western blotting (fig 1A, B), there was profound upregulation of HSP70 expression in the pancreatic acini. Under these conditions, HSP70 expression was confined to acinar cells and localised to the nuclear/perinuclear region. Thirty six hours after thermal stress, HSP70 levels returned to control values (fig 1A) and the immunostaining pattern was similar to that seen in pancreas samples taken from control rats (fig 5D). Administration of caerulein to naïve animals (fig 5E) resulted in modest expression of HSP70 but profound vacuolisation of acinar cells and interstitial oedema. In pancreas samples taken from rats given caerulein 12 hours after prior thermal stress (fig 5F) or 24 hours after isoproterenol injection (fig 5G), the extent of both vacuolisation and oedema were reduced. Under these conditions, HSP70 was localised primarily within those cytoplasmic vacuoles which are noted in acinar cells. No immunostaining was seen when the primary antibody was omitted during the immunostaining protocol (fig 5H). Immunolocalisation of HSP70 in the pancreas. Pancreatic tissues obtained from control rats (A), from rats 12 hours after exposure to hyperthermia (B), from rats 24 hours after β adrenergic stimulation (C), from rats 36 hours after prior thermal stress (D), or from rats given caerulein alone (E) or caerulein after prior thermal or non-thermal stress (F, G) were processed for heat shock protein 70 (HSP70) localisation, as described in the text. While there was very little HSP70 expression in control pancreas (A), exposure of rats to hyperthermia (B) or β adrenergic stimulation (C) resulted in significant upregulation of HSP70 expression. HSP70 expression was similar to that seen in control samples 36 hours after prior thermal stress (D). Administration of caerulein to control animals (E) resulted in modest expression of HSP70 with profound vacuolisation and oedema. Prior thermal stress (F) or isoproterenol treatment (G) significantly decreased caerulein induced vacuolisation and oedema. No immunostaining was seen in sections where the primary antibody was omitted (H). Results shown are representative of three different experiments for each experimental condition. 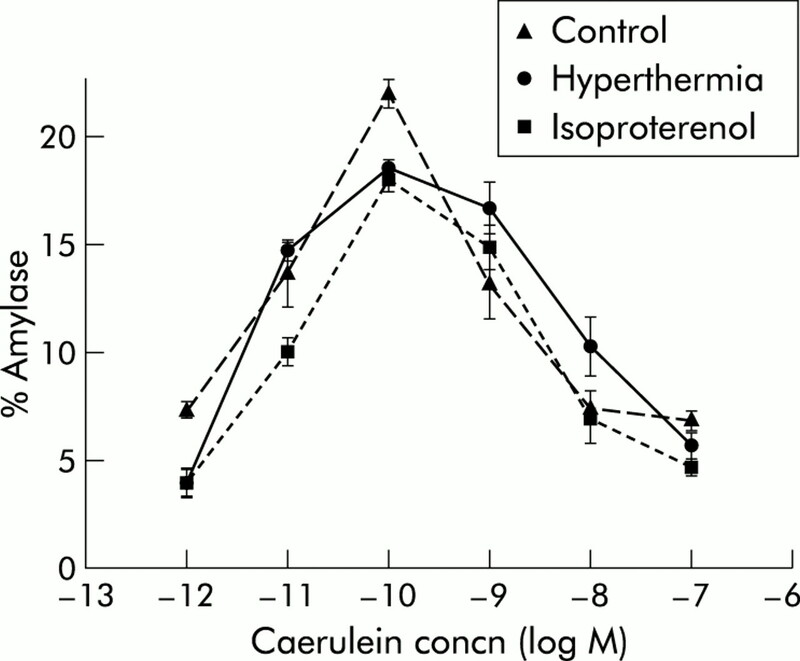 As shown in fig 6, prior thermal stress did not alter the biphasic dose dependence which characterises caerulein stimulation of amylase secretion from acini in vitro. Low concentrations of caerulein stimulated amylase secretion while high concentrations inhibited amylase secretion from acini prepared from control, prior thermally, or non-thermally stressed rats. Caerulein stimulated amylase secretion from rat pancreatic acini. Dispersed pancreatic acini were prepared from control rats, rats pre-exposed to hyperthermia, or rats stimulated with isoproterenol and were incubated with various concentrations of caerulein for 30 minutes. Amylase release into the medium was determined as described in the text. Results are expressed as per cent of total amylase content in acini. Results represent mean (SEM) values obtained from three separate experiments. Caerulein induced pancreatitis follows exposure of the pancreas to high doses of the secretagogue and interaction of caerulein with the low affinity cholecystokinin receptors which mediate inhibition of acinar cell secretion.30 Thus one potential mechanism for protection against pancreatitis that follows either thermal stress or β adrenergic stimulation (and, presumably, HSP70 expression) would be alteration in acinar cell responsiveness to caerulein—that is, downregulation of low affinity receptors or loss of the inhibitory response to supramaximally stimulating doses of caerulein. As shown in fig 6, that is not the case. The in vitro acinar cell biphasic response to caerulein stimulation was unaltered, even in acini prepared from animals previously exposed to thermal stress. One of the earliest events in secretagogue induced pancreatitis involves intra-acinar cell activation of trypsinogen.7 The events which lead to trypsinogen activation during the early stages of pancreatitis are not entirely understood. In previous reports, we have suggested that it might result from colocalisation of trypsinogen and the lysosomal hydrolase cathepsin B within cytoplasmic vacuoles and the subsequent activation of trypsinogen by cathepsin B.6,7 Theoretically, active trypsin could cause activation of other zymogens within acinar cells and this could lead to both acinar cell injury and pancreatitis. In the current report, we noted that the rise in pancreatic level of active trypsin and TAP after supramaximal caerulein stimulation was attenuated in animals previously exposed to thermal stress or given isoproterenol. Neither the pancreatic content of trypsinogen nor the pancreatic content of cathepsin B were altered by prior thermal stress or prior administration of isoproterenol. Attenuation of the rise in trypsin activity could reflect either inhibition of the active protease or reduction in activation of the zymogen. Our finding that TAP levels were also lower in animals after prior stress indicates that stress results in reduction of the activation process itself, rather than causing inhibition of the activated zymogen. The mechanisms by which prior thermal stress or β adrenergic stimulation (and, presumably, HSP70 expression) might interfere with trypsinogen activation in secretagogue induced pancreatitis cannot be determined from our studies. It is tempting however to speculate that those mechanisms might alter either colocalisation of trypsinogen with cathepsin B or the ability of cathepsin B to activate trypsinogen in acinar cells during secretagogue induced pancreatitis. Regardless of the mechanisms involved however our studies add to the growing list of observations which suggest that agents or manipulations which cause upregulation of HSP70 expression might prove helpful in the prevention or treatment of pancreatitis. This work was supported by NIH grant DK-58694 (AKS) and DK-31396 (MLS). JLF was financially supported by grant 81GE-50064 from the Swiss National Science Foundation. Otaka M, Itoh H, Klwabara T, et al. Induction of heat shock protein and prevention of caerulein induced pancreatitis by water immersion stress in rats. Int J Biochem1994;26:805–11. Wagner ACC, Weber H, Jonas L, et al. Hyperthermia induces heat shock protein expression and protection against cerulein induced pancreatitis in rats. Gastroenterology1996;111:1333–42. Figarella CB, Miszczuk-Jamska B, Barrett AJ. Possible lysosomal activation of pancreatic zymogens: activation of both human trypsinogens by cathepsin B and spontaneous acid. Activation of human trypsinogen 1. Biol Chem Hoppe Seyler1988;369:293–8. Gudgeon AM, Heath DI, Hurley P, et al. Trypsinogen acitvation peptides assay in the early prediction of severity of acute pancreatitis. Lancet1990;335:4–8. Lerch MM, Saluja AK, Dawra R, et al. Acute necrotizing pancreatitis in the opossum: Earliest morphological changes involve acinar cells. Gastroenterology1992;103:205–13. Saluja AK, Donovan EA, Yamanaka K, et al. Caerulein-induced in vitro activation of trypsinogen in rat pancreatic acini is mediated by cathepsin B. Gastroenterology1997;113:304–10. Hofbauer B, Saluja A, Lerch MM, et al. Intra-acinar cell activation of trypsinogen during caerulein-induced pancreatitis in rats. Am J Physiol1998;275 :G352–62. Saluja AK, Bhagat L, Lee HS, et al. Secretagogue-induced digestive enzyme activation and cell injury in rat pancreatic acini. Am J Physiol1999;276:G835–42. Laemmli UK. Cleavage of structural proteins during the assembly of the head of bacteriophage T4. Nature1970;227:680–85. Towbin H, Staehelin T, Gordon J. Electrophoretic transfer of proteins from polyacrylamide gels to nitrocellulose sheets: procedure and some aplications. Proc Natl Acad Sci USA1979;76: 4350–54. Kruse-Jarres JD, Kaiser C, Hafkenscheid JC, et al. Evaluation of a new alpha-amylase assay using 4.6-ethylidene-(G7)-1-4-nitrophenyl-(G1)-alpha-D-maltoheptaoside as substrate. J Clin Chem Clin Biochem1989;27:105–13. Gerard C, Frossard JL, Bhatia M, et al. Targeted disruption of the beta-chemokine receptor CCR1 protects against pancreatitis-associated lung injury. J Clin Invest1997;100:2022–7. Frossard JL, Saluja A, Bhagat L, et al. The role of intercellular adhesion molecule 1 and neutrophils in acute pancreatitis and pancreatitis-associated lung injury. Gastroenterology1999;116:694–701. Kawabata S, Miura T, Morita T, et al. Highly sensitive peptide-4-methylcoumaryl-7 amide substrates for blood clotting proteases and trypsin. Eur J Biochem1988;172:17–25. Powers RE, Saluja AK, Houlihan MJ, et al. Diminished agonist-stimulated inositol triphosphate generation blocks stimulus-secretion coupling in mouse pancreatic acini during diet-induced experimental pancreatitis. J Clin Invest1986;77:1668–74. Rutledge PL, Saluja A, Leli U, et al. A simple and efficient method of measuring in vitro amylase secretion by dispersed pancreatic acini. Pancreas1988;3:508–11. Currie RW, Karmazyn M, Kloe M, et al. Heat shock response is associated with enhanced postischaemic ventricular recovery. Circ Res1988;63:543–9. Yellon DM, Downey JM. Current research views on myocardial reperfusion and reperfusion injury. Cardioscience1990;1:89–98. Bhagat L, Singh VP, Hietaranta AJ, et al. Heat shock protein 70 prevents secretagogue-induced cell injury in the pancreas by preventing intracellular trypsinogen activation. J Clin Invest2000;106:81–9. Ritossa FM. A new puffing pattern induced by temperature shock and DNP in Drosophila. Experentia1962;18:571–3. Bellmann KA, Wenz J, Radons V, et al. Heat shock induces resistance in rat pancreatic islet cells against nitric oxide, oxygen radicals and streptozotocin toxicity in vitro. J Clin Invest1995;95:2840–5. Wong HR, Mannix RJ, Rusnak JM, et al. The heat shock response attenuates lipopolysaccharide-mediated apoptosis in cultured sheep pulmonary artery endothelial cells. Am J Respir Cell Mol Biol1996;15:745–51. Gething MJ. Role and regulation of the ER chaperone BiP. Semin Cell Dev Biol1999;10:465–72. Haas IG. BiP (GRP78), an essential hsp70 resident protein in the endoplasmic reticulum. Experentia1994;50:1012–20. Pelham H. Speculations on the function of the major heat shock and glucose regulated proteins. Cell1986;46:959–63. Beckman RP, Mizzen LE, Welch WJ. Interaction of HSP70 with newly synthesized proteins: implications for protein folding and assembly. Science1990;248:850–4. Yost HJ, Lindquist S. RNA splicing is interrupted by heat shock and rescued by heat shock protein synthesis. Cell1986;45:185–93. Pelham HRB. Activation of heat shock genes in eukaryot cells. Trends Genet1985;1:31–5. Amin J, Ananatham J, Voellmy R. Key features of heat shock regulatory elements. Mol Cell Biol1988;8:3761–9. Saluja AK, Saluja M, Printz H, et al. Experimental pancreatitis is mediated by low-affinity cholecystokinin receptors that inhibit digestive enzyme secretion. Proc Natl Acad Sci USA1989;86:8968–71.